This content is not hosted on MetEd. 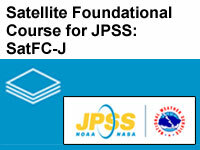 The Satellite Foundational Course for JPSS (SatFC-J) is a series of short lessons focused on topics related to microwave remote sensing and Joint Polar Satellite System instruments and capabilities. Hosted by the Cooperative Institute for Research in the Atmosphere (CIRA), this resource provides access to the full set of course lessons, which were developed specifically for National Weather Service (NWS) forecasters. The lessons provide foundational training to help forecasters and decision makers maximize the utility of the U.S.’ new-generation polar-orbiting environmental satellites. The course is intended to help learners develop and improve their understanding of the value and anticipated benefits of JPSS, including improved monitoring of meteorological, environmental, and climatological phenomena and related hazards. The full listing of lessons is accessible through the SHyMet website. [Note that NOAA personnel should access the lessons through the Commerce Learning Center (CLC).] Training developers include VISIT/SHyMet staff from the Cooperative Institutes at CIMSS and CIRA; COMET; the Cooperative Institute for Mesoscale Meteorological Studies (CIMMS); the Short-term Prediction Research and Transition Center (SPoRT); and the NWS Office of the Chief Learning Officer (OCLO).